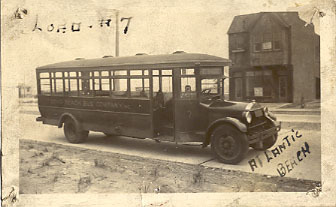 This shot was taken 4-15-1930 and is one of the Long Beach Bus Company buses.. the caption says' "Stanley Bus", which was Bob's dad. 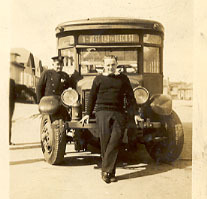 Stanley Foster in front of his bus in the summer of 1928. 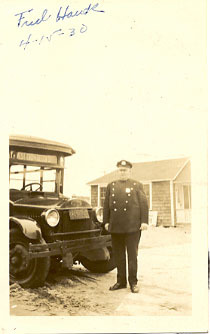 The police officer is identified as probably being Fred Hauck. 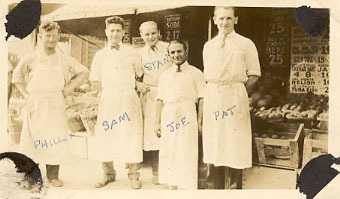 Believed to be taken in the West End. 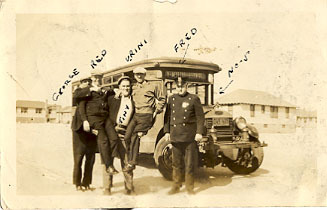 Each of the these bus photos were captioned "West End via Beech St".. all were driven by Stanley Foster. If you can identify anyone or anything else in the photos, please email me. Here's a shot you won't see anywhere else (I don't think! 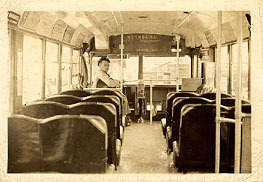 ): the inside of an old LB Bus . This may be a slightly later vintage than the ones above, perhaps a late 1930's model. Stanley Foster at the wheel. 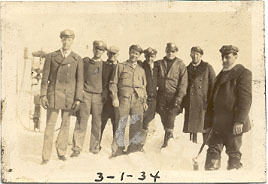 This one Captioned "Load # 7, Atlantic Beach". Anyone recognize the building? Looks like a storefront. email me if you know. 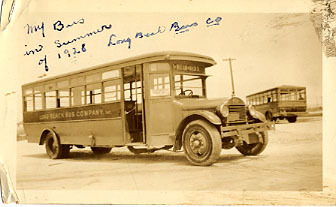 This is captioned "My bus in summer of 1928, Long Beach Bus Company" Great photo! 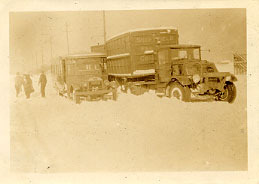 Year unknown here, but obviously late 1920's judging from the bus. 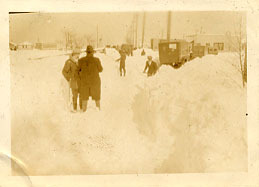 This shot was taken in front of the train station looking to the East. 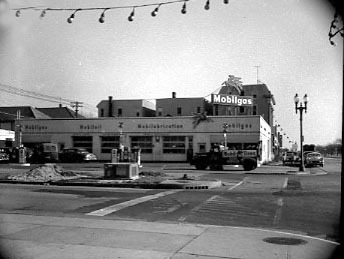 The large building in the background was the Park David Hotel, which burned down sometime in 1964 or 1965. 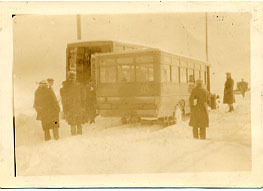 The note on this photo said " Bus 18 helps unload a truckload of what appears to be milk crates from Sheffield Farms".. but was it really milk? or maybe prohibition booze? 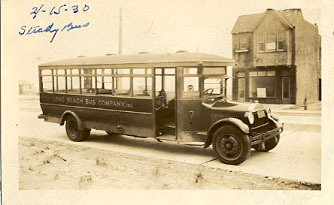 That's a thought to consider, Long Beach had a colorful reputation during prohibition! They even lit lights in the old city hall tower to signal the rum runners who unloaded on the beach! More on that another time !! Another shot unloading the "Milk" truck !!! 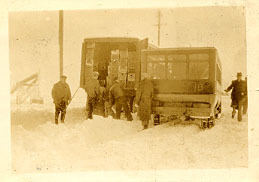 A photo taken from the front of the "milk" unloading operation !! Check out that tractor trailer !! 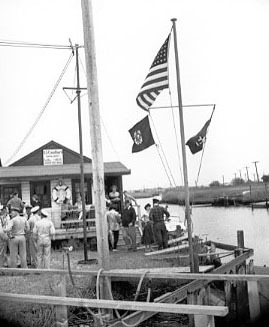 The Coast Guard Auxiliary shack. 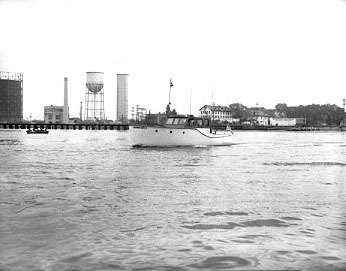 This was located on Reed Channel, circa 1951. 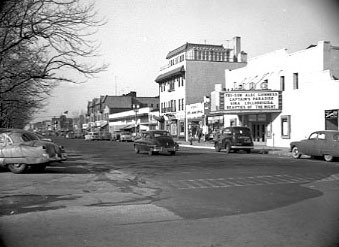 Reynold's Channel, circa 1955. The Cracker Jack is the name of the boat. The old and new water towers and the incinerator are plainly visible in this shot. 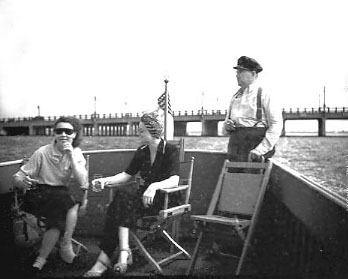 The back of Johnny Elson's boat with, I think, the Long Beach Bridge in the background. Elson is the man standing. 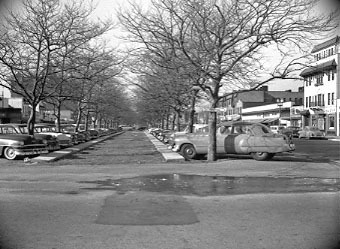 He lived on a canal in Freeport next door to Guy Lombardo. The lady on the left is my mother, Dorothy Foster. The lady in the middle is Mae Johnson, wife of Vinnie Johson. Vinnie and my father both worked for Sunoco. If you have any photos or information on anything you saw here !! 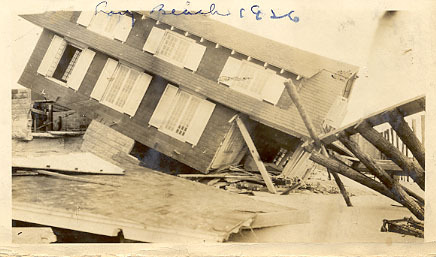 These two photos are captioned Long Beach 1926. 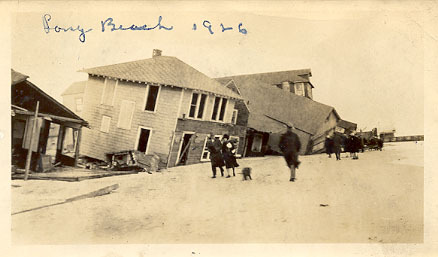 Doubtful that this was a hurricane, judging from the heavy winter clothes worn by the people in the left photo. Most probably a spring Northeaster. There were many powerful Northeasters during the 20's according to the research I did on various weather sites. Can anyone provide any more info on the storm or the locations shown ?? 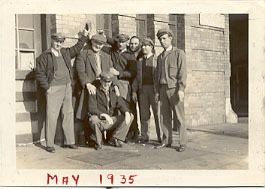 Taken in May 1935 obviously ! 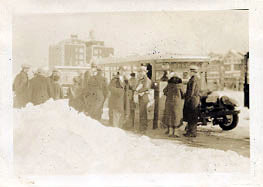 A group of the Long Beach Bus drivers outside the bus terminal. Names unknown.. can anyone help ? This is more Oceanside than Long Beach, but what the heck !! 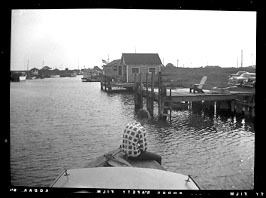 Approaching the dock at the old Coast Guard Auxiliary shack on Reed's Channel. Use the INDEX PAGE for all our links!